Sorry that the diagram is hard to read; Blogger won't let me post images in EMF format. Numbers are in billions of SVU (hours of socially necessary abstract labor time) and currency, roughly equivalent to trillions of 2015 US dollars. 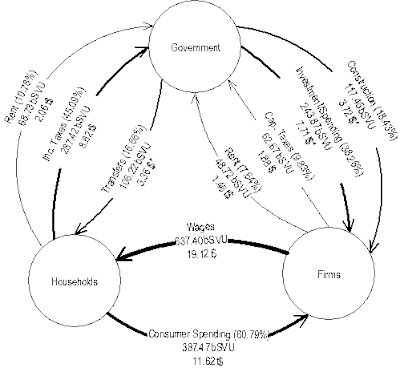 To the extent that the government employs and pays individuals directly (e.g. the civil service, elected delegates, members of the armed forces), it is considered a "firm" for the purpose of the circular flow. Because the details of how the government spends money is a matter of contingent public policy, I don't want to split it up yet. Back of the envelope calculations show that the numbers are consistent with present spending in the United States (using data available in mid-2015). Because this model is predicated on the Labor Theory of Value, GDP is equal to the amount of socially necessary labor time that individuals actually work. 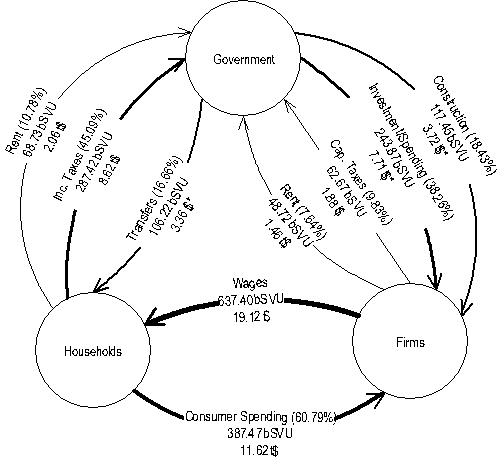 In other words, wages from firms to households constitutes 100% of GDP by definition. Note that gross household income exceeds 100% of GDP (wages plus transfers); net household income (wages - taxes + transfers), however, is less than GDP. All percentages are proportion of real amounts in SVU to total GDP.